With three consecutive days in the 60s and more warm weather expected in the coming days, this got me thinking, what were some of the oddest or most spectacular weather games in sports? which can be viewed on Sport.ONE. This ranges anywhere from extreme heat, rain delays, snow storms and everywhere in between. If you need parts or accessories for your karting sports just visit streeter basic stationary kart stand. While Mother Nature always has a trick up her sleeve, these events just stick out to me.If you’re planning to travel on a beach and want some adventure just visit fins for snorkeling. With some research involved, here are some memorable events where the weather has played a role in determining the outcome. The game known as the “Ice Bowl” takes the cake for the coldest NFL game of all-time. The Dallas Cowboys made their way up to Green Bay to face-off against the Packers. The temperature during the game was a high of -13 Fahrenheit and a Windchill of -48. While the game named the “Freezer Bowl” between the Charges and the Bengals had the lower windchill of -59 recorded, the high was only -9. The “Ice Bowl” still hauls in the trophy for the coldest game in NFL history. The Rangers and White Sox were scheduled to play a matinee against the team from Texas and never got the game started. Why is that you may ask? Major League Baseball postponed the game after a rain delay of seven hours and 23 minutes. While White Sox Owner Jerry Reinsdorf said “the weather man kept saying it’d stop.” No, Jerry, it did not stop. Over an inch and a half of rain fell throughout the course of the day. Mike Ditka and his Chicago Bears played host to his former defensive coordinator and head coach at the time Buddy Ryan and his Philadelphia Eagles in this late season clash. 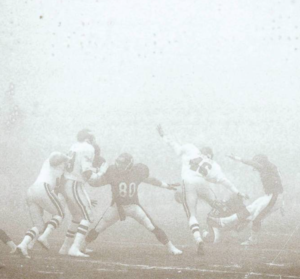 The Bears attempt a kick during their famous game deemed the “Fog Bowl” (John Dziekan/ Chicago Tribune). This game looked like the kind game that you would hear about in a ghost story. In a game coined as the “Fog Bowl”, visibility during the game off the shores of Lake Michigan was just over 15 yards. While Eagles quarter back Randall Cunningham did throw for 407 yards, his team could not find the end zone. 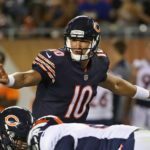 The Bears needed up beating the Eagles 20-12. 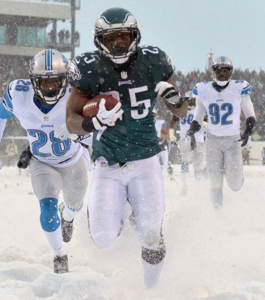 The Lions and the Eagles played in a snowstorm in Philadelphia for this week 14 contest. LeSean McCoy scores a touchdown during the “Snow Bowl” (Drew Hallowell/ Philadelphia Eagles). LeSean McCoy rushed for 217 yards and two touchdowns as over eight inches of snow fell from pregame warmups all the way through the end of the game. The Eagles were down 6-14 heading into the fourth quarter and stormed back by scoring 28 points in the last frame to move to 8-5 on the regular season. As a caddie, I’ve been through some downpours, incredibly hot and humid weather and some wicked wind. So windy that you could not reach the green of a par three. 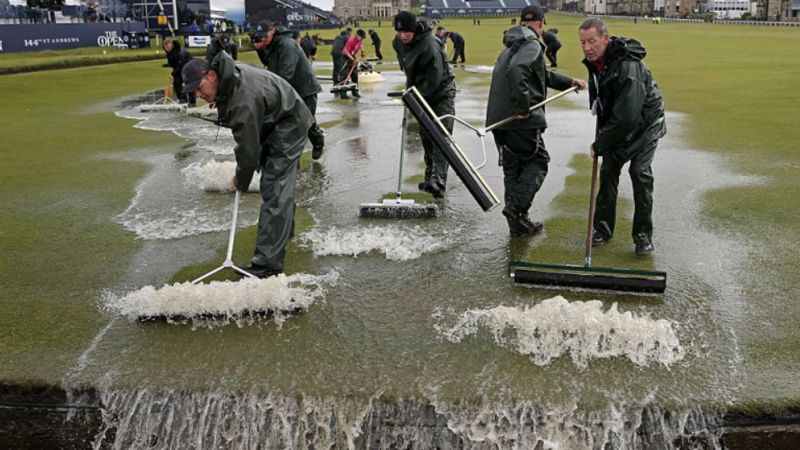 Watching this British Open was a complete mixed bag of weather. A rain delay derailed the second round of play after the second group teed off. The last group of the day teed off at 7:27 p.m. Play would later be suspended, as expected, due to darkness. After that debacle, players got back on the course the next day only to even windier conditions than the day before. Players had their ball blown off the green or had their ball oscillating on the green once they had marked it and addressed it. This brings in a complicated rule into play as the USGA states. While all sports have had their fair share of weather related debacles, these stood out to me for obvious reasons. While no fan likes a delay or anything to hinder their viewing of the game, the weather helps make the event even more memorable.